fordable approach to integrating community-wide safety and security systems, with the ReZcare nurse call system. ReZcare is a comprehensive communication system with unlimited capabilities for call for aid, activity monitoring, notifcation, and reporting. 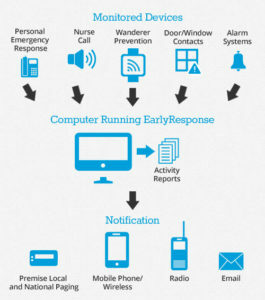 ReZcare is a computer-based system using EarlyResponse software for managing, and monitoring all wireless devices and integrated systems, 24/7. It also monitors motion and egress areas of the facility. 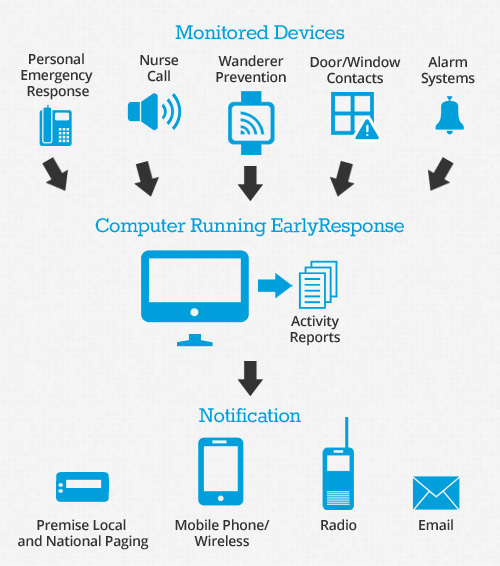 Alarm notifications are sent to wireless devices and the alarms, and events are permanently recorded. Reports of daily alarms and events can be easily generated, viewed on the monitor, or printed. ReZcare’s system generates reports for analyzing source of calls, and the response times. ReZcare’s system is capable of maintaining patient and resident records, including photographs, medical information, family contact information, and physician information. All patient information is password protected, and secure. is notified if a problem is detected. EchoStream® technology is the next generation in commercial grade wireless from industry leader, Inovonics Wireless. Inovonics has over 20 years of experience applying frequency hopping, spread spectrum, 900 MHz technology, to create a premier wireless platform. This powerful, yet affordable technology embodies the most recent advances in radio frequency for the ReZcare system components.